Baby's comfort. Cozy cloth is more comfy than wearing paper and plastic. The environment. Less garbage in the landfills. Supposedly potty training is easier and happens earlier because toddlers can actually feel when they are wet. I'm holding out for this one to be true. No polyacrylate gel which is suspected of exacerbating asthma. Cloth diapers are cute, and--I'll just say it right now--they are really really hip! About that last reason. Crunchy mamas are just kind of expected to use cloth diapers these days. If you went through a Bradley class, if you birthed your baby tough 'n' natural, if you breastfeed with any kind of enthusiasm... well, where are the cloth diapers? This is a silly truth about mama-to-mama peer pressure, folks. But hey, at least peer pressure in this case does probably mean better things for this earth and better things for my baby! We honestly can't see any negatives to natural childbirth, breastfeeding, organic food, and cloth diapers. Other than more work for Mom, these seem to be fairly positive things for our children and our world. So, not knowing much more than this, I decided to embark into cloth diapering. We were on the move from the day Lena was born. The laundry involved in cloth diapering was not feasible! We are on a tight budget, and investing in enough cloth diapers for Lena took more $$$ than we were willing to shell out at one time. So we cruised along with gifted disposable diapers as well as inexpensive deals at the commissary (military grocery store). Finally I asked for cloth diapers for my birthday and for Christmas, and I bought three diapers on a Black Friday sale, and we ended up with a generous 19 bumGenius 4.0 One-Size Snap Closure Cloth Diapers by the New Year. We were ready to begin! Poop. You have to get the solid waste out of the diapers before you throw them in the wash. I recommend Real Nappies Bioliner Flushable Diaper Liners; I just flip the liner and all its contents into the toilet and am left with a smelly diaper with no poop on it. Brilliant. Smell. They can give your baby's nursery a permanent odor! Invest in a trash can with a tight lid. We use a Diaper Champ . Wash. You'll be doing a lot of laundry. I do a load of diapers every other day, which involves one rise cycle and then one wash cycle [usually]. I use All Small & Mighty, HE, Triple Concentrated Liquid Laundry Detergent . Diapers take so little detergent (too much detergent hurts their absorbency) that this one little bottle has lasted us almost a year! Dry. I can't put BumGenius covers in the dryer, so I almost always dry everything outside. Sunshine is an amazing natural bleach for any leftover stains. Stuffing. No one told me that I would spend 15 minutes every other day "recreating" my cloth diapers. At least with the BumGenius pocket-stuff type, there are two pieces that have to be snapped and fitted back together after every wash. When the load is dry, I spend a good quarter of an hour kneeling on the floor snapping, stuffing, and stacking diapers. Mama's job. Daddy doesn't do any washing, any drying, any stuffing, because he is at work when all that happens. He changes maybe one diaper a day, maybe a couple more on weekends. This commitment is almost entirely on my shoulders. Working with my hands. I love to knit, to knead a loaf of bread, to fold laundry, to make a bed. I enjoy working with my hands. And so, poopy and stinky though this job may be, I get a deep and real sense of satisfaction as I pull clean diapers out of the wash and put up a fresh, dry stack of diapers in Lena's changing table. Silly as it sounds, this is the #1 reason I enjoy cloth diapering. Cost. 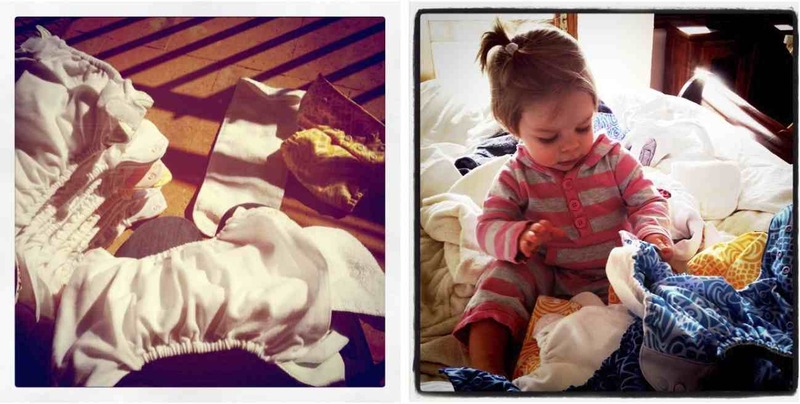 These cloth diapers were free, almost entirely thanks to generous family members! Disposables from the store are not. We'll stick with cloth. Environment. They say it's better for the environment long-term. I think I trust them... even though we do a crazy amount of laundry and use a lot of energy. But they say it's better. So okay. Potty training. Like I said before, mamas and experts promise it's easier with cloth diapers than with quick-wicking disposables. I'm hanging on for that. She couldn't care less. Lena doesn't seem to mind if she's in cloth or disposable. (Or if she's wet or dry, for that matter, so perhaps that makes easier potty training promises null and void? Oh dear.) Her skin doesn't mind either; we haven't had major issues with diaper rash with either option. Cuteness. She looks so stinkin' cute in these patterns and colors! Don't you think so too? What a great post. I've been trying to research disposable vs cloth, and it seems the only real sources of useful information are blogs. Thanks! Hi Becca! Do you remember where you got the diapers on sale on Black Friday? it's coming up and I'd love to get a deal on diapers if I can!